Turnbuckles are basic tensioning devices that couple two items. They help keep structures anchored to the ground, screen doors flush with an opening, fences taught at end posts, and many other things. Adjusting a turnbuckle can shore up a sagging screen door, straighten a tilting television antenna, or keep a tractor secured to a travel trailer. Turnbuckles come in a variety of shapes and sizes, but the basic concept is the same: a few twists of a wrench can tighten or loosen the coupling joint. Grip the roller on the wrench head between your thumb and index finger and twist until fully open. Hold the wrench opening over the turnbuckle with one hand. With the other hand, twist the roller in the opposite direction until the wrench fits snugly against the turnbuckle hex nut. The hex nut typically is one to two inches long. With the wrench seated against the turnbuckle hex nut, wobble the handle up and down gently while continuing to apply pressure to the roller. This ensures a proper sizing of the wrench. Turn the wrench clockwise to tighten, counterclockwise to loosen. Tightening draws wire taut. Loosening makes it sag or easier to remove. Stop the adjustment occasionally to inspect the progress. When adjusting a screen door, for instance, remove the wrench and allow the door to swing closed. When adjusting wire, stop to check the tension and stress on the end posts. Repeat steps 1 and 2 as necessary until the device being adjusted has reached the desired tension. Some turnbuckles cannot be adjusted with a wrench. These typically require a wrench handle to be slipped between a U-shaped joint. 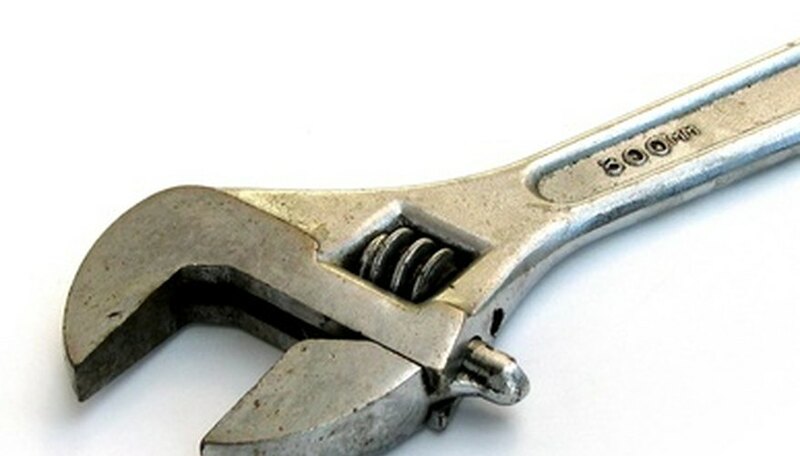 Adjustment of a U-shaped turnbuckle follows the same steps as a hex-nut turnbuckle, except without the necessity of sizing the wrench to fit the nut. Sam Smith has worked as a professional writer since 2005. His work appears in several publications including "Sauk Valley Newspapers," the Rochester "Post Bulletin" and the "Guardian" of Nassau, Bahamas. Smith received a Master of Science in journalism from the University of Illinois.